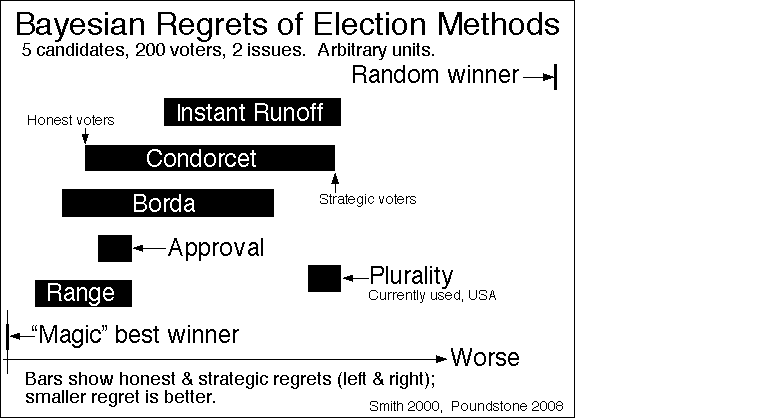 For the Bayesian-regret measurement study via massive computer election simulations using many election systems, see paper #56 here. Regret measurements. Column A: 5 candidates, 20 voters, random utilities, each entry averages the regrets from 4000000 simulated elections. Column B: 5 candidates, 50 voters, utilities based on 2 issues, each entry averages the regrets from 2222222 simulated elections. As you can see, Range voting has a lot smaller Bayesian-regret than the other systems either for honest or for strategic exaggerating voters. (The full study also tried different levels of voter "ignorance." Range was still the best at all settings.) Warning: this table makes it appear that Borda is the second-best system after range. But in fact the full study considers about 100 tables of this kind, and in many of them, Borda is not second best, in fact in many of them it is way down in the rankings. The question of which system is second best has no clear answer – some of them are better in some kinds of election situations, others in others. But range voting always came out best (or at least tied for best) in all the tables. How big an improvement is this? Huge. In this (and other) tables, the reduction in regret you get from switching to range instead of plurality is a factor of 7-10 for honest voters and 2-3 for strategic ones. That was larger than the improvement in regret we got by switching from non-democratic systems such as monarchy (we assume monarchs, on average, were as least as good rulers as a random candidate, since, e.g. they were trained from birth to rule), to plurality: only a factor of 2-4 for honest voters and about 1.6 for strategic voters. Also, if you do not like multiplicative factors – you like additive differences – then the improvement we got from switching from random winner to (our current) strategic plurality is comparable to the improvement we should get from the future switch to range voting with a mixture of honest & strategic voters. Want to convert this to dollars? Check these economic estimates or these crude ones based on historical elections. In other words you get comparable or more improvement in democracy by switching from plurality to range voting, than you get from the very invention of democracy in the first place.